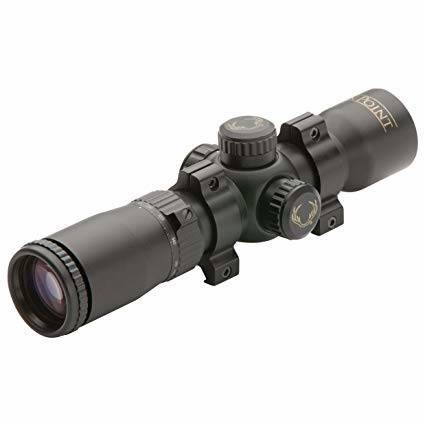 Probably the most important benefit that you will get if you decide to go for this alternative is that it comes with fully multi-coated 1.5 to 5x optics. On the one hand, you get a lot of versatility because you are able to adjust the zoom as per your needs. On the other, it’s worth noting that fully multi-coated optical components are always top-quality, so the images you’re going to look at are definitely going to be bright and clear. There used to be a red ring around the lens on older versions, and that made it impossible for the hunter to go unnoticed by the prey. Fortunately, the manufacturing brand has removed it so as to make it as user-friendly as possible, especially for your particular purposes. As we have mentioned in the introduction, the best thing about this alternative is that you will be able to make the most of it in a host of situations. More often than not, scopes come with a fixed magnification, which doesn’t give you the capability to work your way around different hunting circumstances. This is not the case with the TenPoint Crossbows HCA-09811, however, since it comes with 1.5 to 5x optics. Merely adjust the scope as per your liking or depending on what your momentary hunting situation calls for. From the information that we have gathered about this option, its tube is made out of aluminum, which means that it doesn’t weigh too much and it won’t be too heavy along with the crossbow as you use it. The tube measures just 8.25 inches, so that’s another thing not to worry about. It’s pretty compact, but most of the reviews we’ve gone through in this sense actually praise its ruggedness and ability to last for as long as possible. 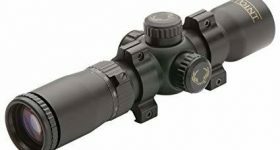 When it comes to crossbow scopes, you have to pay extreme attention to the optical components that they come with. Otherwise, your whole experience might be ruined on account of you not being able to spot your target as you should. Luckily for you, this particular model comes with fully multi-coated optics. What does all of this mean? The number of coatings on the lenses of any optical instrument matters a lot, because they can make the difference between a quality unit that you need and will enjoy using and one that will disappoint you because it won’t have great performance. Thanks to the optics that it comes with, the TenPoint Crossbows HCA-09811 is capable of offering you crisp and clear pictures. That, in turn, means that, since you are going to be able to see clearly, you are also going to be capable of spotting your targets with more efficiency. What this spotting scope does is actually spot your potential prey and it’s really good at doing that. We couldn’t leave out the field of view boasted by this alternative, and that’s because it’s 50 feet at 100 yards. With that much width, you will be able to track your targets even as they move. Besides, since you already have the advantage of excellent optics, you might want to know that the resolution remains great even when the scope is used at maximum magnification. If you have tried out other crossbow scopes, you undoubtedly won’t find it hard to use this particular one. Based on the feedback provided by some of the hunters who reviewed the product, it seems that it is easy to set up on the weapon of your choice. On top of everything, you can even make the most of it by utilizing it with two or more crossbows, especially since this one is a great fit for bolts that fly between 275 and 425 FPS. Besides, it comes with a comfortable eye relief, so that’s one less thing to worry about. You might want to know that TenPoint also makes crossbows, and that’s one of the reasons why this product actually meets and even exceeds the expectations of many bow hunters. It’s a quality piece of equipment that will help you increase your hunting performance, and its variable zoom is definitely something you wouldn’t encounter in other options.